Earlier today, President Trump released details for his FY18 budget proposal. It is a ‘skinny budget’, in that it only covers discretionary funding, and within that, doesn’t fully list the impact on all discretionary programs.The proposal cuts funding to the US Education Department by $9 billion (13 percent). It provides a $1 billion increase for Title I, but the increase is for states and districts to use for portability and choice. This is in addition to a new $250 million school choice/voucher program and a $168 million increase for charters, bringing the total amount of NEW funding in the President’s budget for choice to $1.4 billion. The budget level funds IDEA, eliminates ESSA Title II Part A and eliminates the 21st Century Community Learning Centers. “AASA is deeply concerned that the first budget proposal from the new administration doesn’t prioritize investment in the key federal programs that support our nation’s public schools, which educate more than 90% of our nation’s students. While we would normally applaud a proposal that increases funding for Title I by $1 billion, we cannot support a proposal that prioritizes privatization and steers critical federal funding into policies and programs that are ineffective and flawed education policy. The research on vouchers and portability has consistently demonstrated that they do not improve educational opportunity and leave many students, including low-income students, student with disabilities, and students in rural communities-underserved. AASA remains opposed to vouchers and will work with the administration and Congress to ensure that all entities receiving federal dollars for education faces the same transparency, reporting and accountability requirements. “AASA is disappointed at the significant cuts proposed to critical education programs, including the Every Student Succeeds Act (ESSA) Title II. FY 18 dollars will be used by schools across the nation in just the second year of ESSA implementation, and the idea that this administration thinks that schools can do this work—and the administration claim they support this work—without supporting teachers and teacher leaders, and their professional development, is a deeply disconcerting position. “As recently as yesterday Secretary DeVos indicated an interest in supporting state and local education agencies, and “to returning power to the states whenever and wherever possible.” AASA is concerned that while the department indicates they want to return power, the proposed funding levels—including continued level funding of the Individuals with Disabilities Education Act (IDEA) and cuts to core programs in ESSA—deeply undercut state and local efforts in these areas and expand the reality of federal requirements without commensurate support, further encroaching on state and local dollars. The return of power, however well intended, when systematically and deliberately paired with low funding, translates into unfunded federal requirements. “AASA remains committed to parity between defense and non-defense discretionary (NDD) dollars, and we are deeply opposed to the proposed $54 billion increase in defense discretionary spending being offset by NDD spending cuts. AASA supports robust investment in our nation’s schools and the students they serve, and we support increased investment for both defense and NDD funding by lifting the budget caps, as set forth in the Budget Control Act of 2011, for both. NDD programs are the backbone of critical functions of government and this proposed cut will impact myriad policy areas—including medical and scientific research, job training, infrastructure, public safety and law enforcement, public health and education, among others—and programs that support our children and students. 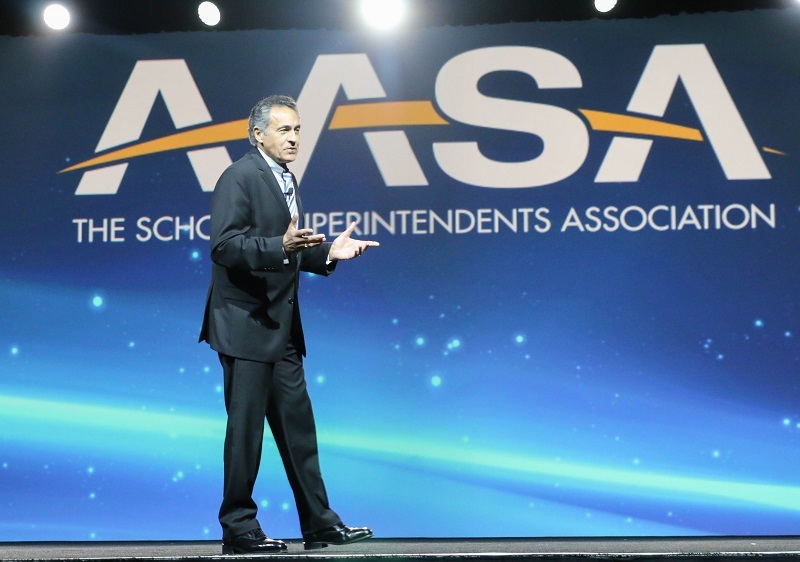 Dan Domenech, executive director, AASA, speaking at the 2017 AASA National Conference on Education in New Orleans, La. There has never been a more important time than now to speak out about the value of public education and the 50 million students in our public school buildings. With that thought in mind, on behalf of AASA, The School Superintendents Association, let me say thank you to the hundreds of superintendents, education stakeholders and sponsors who joined us in New Orleans last week for the 2017 National Conference on Education. Positive reaction continues to pour in from all over the country about our conference, which draws some of the sharpest minds in public education on an annual basis. Key topics during this year’s edition were curriculum and instruction; digitizing education; equity; leadership for equality; personalizing education; principal supervision initiatives; and superintendent/school board relationships. For the second year in a row, AASA hosted a Social Media Lounge, providing attendees with opportunities to learn best practices currently being used in school districts while gaining hands-on social media assistance. No longer is our conference a gathering that kicks off on a Thursday only to wind down on Saturday. With the growing number of superintendents and aspiring superintendents participating in our leadership programs and consortiums, full-day meetings involving these participants now convene on Monday. This is clearly an illustration of effective professional engagement at work. Congratulations to the two cohorts of educators who were recognized for completing the rigorous National Superintendent Certification program and the two Urban Superintendent cohorts that also completed their programs. It’s a pleasure, yet not surprising, to see the enthusiasm generated by these individuals who are making huge leaps in their careers. On Day No. 1 of the conference, it was an honor to congratulate Matthew Utterback, superintendent of Oregon’s North Clackamas School District, who was named AASA’s 2017 National Superintendent of the Year. A $10,000 college scholarship will be presented in Superintendent Utterback’s name to a student in the high school from which he graduated or the secondary school in North Clackamas. It was equally gratifying to recognize the three other National Superintendent of the Year finalists—Barbara Jenkins (Orange County Public Schools, Orlando Fla.), Stewart McDonald, Kodiak Island Borough School District, Kodiak, Alaska) and James Merrill (Wake County Public School System, Cary, N.C.). Aramark and VALIC co-sponsor the NSOY award program. In his address at the first General Session, AASA President Alton Frailey continued with his prevailing theme in 2016-17—Communities 4 Schools. Quoting Abraham Lincoln as saying “Public sentiment is everything,” Frailey called on “third-party folks” – civic and religious leaders – to challenge the notion that all public schools are failing. “How do we recapture the public sentiment and support for public education?” he asked. During the second General Session, we announced the Redefining Ready! National Scholarship 2017, to be sponsored by Hobsons. The scholarship competition allows students to tell the world why they are college, career and life ready through a 30-second social media video. Fifteen students will win scholarships ranging in value from $1,000 to $10,000. We also honored former U.S. Education Secretary John B. King Jr., and presented him with the annual Effie H. Jones award. This award recognizes leaders who exemplify the qualities modeled by the late Effie Hall Jones, and her professional and personal commitment to diversifying the field of education with high quality leaders to ensure the best education for all students. A key takeaway among a myriad of takeaways from NOLA is as follows: Public Education IS working! We would not be the most powerful country in the world without our public schools. By every criterion and measure we use, reading and math scores in NAEP, high school graduation, drop-out rates and college attendance rates, our performance is the best that it has ever been. We will continue to protect the interest of our students and ensure that public education is not subject to privatization attempts that will drain much needed dollars from school district budgets. Together, we will continue to be champions for our children and public education. Once again, thank you to those who made the journey to New Orleans. We look forward to seeing you and many more school district leaders in Nashville for NCE18. For wall-to-wall coverage of AASA’s 2017 National Conference on Education, visit our newly re-designed Conference Daily Online.